My partner, Giovanni Castellucci, and I have been placing dental implants in our periodontal practice for over 27 years. Every day, we see an ever increasing amount of requests from our restorative colleagues and patients from Boston, Newton, Framingham, and the surrounding metrowest communities for extraction of a compromised tooth, followed by immediate dental implant placement and restoration (Teeth in a Day). Years ago, this was a very challenging proposition for a variety of reasons, and we oftentimes had to decline these requests and follow a more traditional treatment protocol. However, with the current advances in dental implant design (including surface technology, thread pattern, and restorative connection), we can confidently and predictably deliver immediate dental restorations in one dental appointment. One of our favorite dental implants for “teeth in one day” is the NobelActive fixture from NobelBiocare. We have been impressed by the tremendous stability at insertion (70 Ncm), platform switch – bone preservation design, surface technology to maximize bone-implant contact and osseointegration, and ease of restoration. Case selection is paramount to assure a successful outcome, and not every patient is truly a candidate for these procedures. Every case has to be thoroughly evaluated on its own merits. And, there is no substitute for clinical experience and surgical expertise. 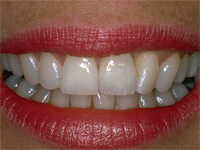 In the end, our mission is to have a happy and healthy patient with normal function and a beautiful smile.